The Thomson X2 is for the rider who understands what it takes to stay up front. Energy wasted in flex is the enemy. The X2 keeps your energy moving forward. 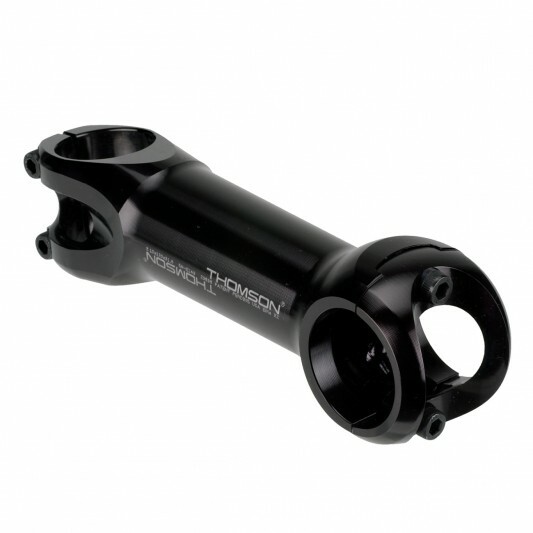 The Thomson X2 Road stem allows you to realize the benefits of stiffer forks and stiffer 31.8 bars. X2 offers precise steering, tracking, and more control while riding, all wrapped up in a beautiful design.The Thomson X2 features a lighter, 2-bolt handlebar clamp. The interlocking clamp of the X2 makes is as torsionally strong as other 4-bolt designs, while being lighter and narrower. X2 has a low 36mm stack height. X2 is available in 2 rise options; 10 and 17 degree. Both the 10 and 17 degree stem can be run with a positive or negative rise, and the reversible graphics will be right either direction. 10 degree stems work well for average riders/amateur racers, while those who want a very aggressive aero position or who want a very upright position can use the 17 degree stem to meet their fit needs.